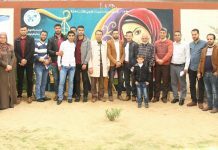 A high-level delegation from the Office of High Commissioner for Human Rights (OHCHR) visited the headquarter of the National Society for Democracy and Law to have a look around the humanitarian situation in Rafah city. 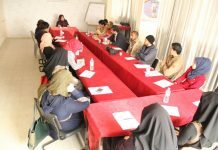 The delegation, consisted of Mr. James Hennan, Mr. Neil Tobin “the director of OHCHR at Gaza Strip”, Prof. Tariq Mkhimer, “an officer in OHCHR” and Ms. Noor Alrayes “an assistant in OHCHR at Gaza Strip”, visited NSDL to discuss the disturbing issues with the stakeholders. Dr. Ibrahim Muammar “the chairman of NSDL” and an elite group of civil societies representatives, lawyers and journalists attended the meeting as well. Prof. Tariq opened the meeting introducing the delegation members and welcoming the guests. He gave Mr. James the chance to talk about the nature of the work of OHCHR in the occupied territories and their role in monitoring, documenting and reporting the violations took place there and then making recommendations to the UN. Mr. James mentioned that their main role was not to provide financial support but rather to make recommendations to solve the issues. He explained that they came to discuss the disquieting problems in the Gaza Strip and particularly in Rafah city. Mr. Neil talked about the bad situation in which the Palestinian People were living expressing his pleasure of the Palestinian people’s steadfastness and being able to live within the severe blockade and the economic deterioration. He showed his regret for being powerless to change the situation in the Gaza Strip. 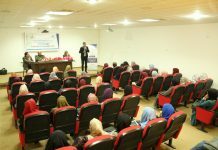 Dr. Ibrahim Muammar started his speech welcoming the delegation and confirming that such a visit added much of pleasure and pride to the organization, since it was in the far south of Gaza Strip “a marginalized area”. After that, he talked about the Gazans’ suffering owing to the three successive wars committed by the Israeli occupation within 10 years. He mentioned that these wars caused mass destruction of the infrastructure of the Gaza Strip in many areas and resulted in loss of life, injuries and disabilities. Moreover, he emphasized that the blockade imposed for more than a decade deepened the suffering and made the situation get worse and worse. He called the international community institutions to commit to their ethical and legal responsibilities, stop the violations against the Palestinian people and make them enjoy their economic, social and political rights. The attendees were given a chance to raise their inquiries and express their opinions. Some of them talked about the suffering of the farmers and fishermen who always found a problem for being close from the occupation in both the sea and the agricultural border areas. They noted the problem of reducing the areas of fishing and preventing the farmers from reaching their lands and spraying the lands with poisonous pesticides. One of the war victims, citizen Wael Al Namla, also talked about his suffering. His son was killed and his leg was amputated as well his wife’s two legs. He called for his simplest rights to attach him and his wife prostheses to keep up his strength. Other attendees talked about movement restrictions and closing crossings, which led to impeding patients and students from perusing their interests. In addition, they mentioned the problem of the journalists not being able to access knowledge freely. Over and above that, they discussed the issue of UNRWA shortage of financial support; the thing which affected the work of civil societies badly. Furthermore, they addressed the problem of not having People-with-disabilities-friendly-educational institutions that supported this category. They tackled many issues, such as child labor, the constant increase of divorce rates, domestic violence, graduates’ unemployment, denying the rights to travel to study abroad, the badly affected Palestinian sport and playgrounds by the successive wars, the increase of crimes rates, prison overcrowding of criminals and people who could not pay debts and bankruptcy of businessmen and traders. The attendees kept wondering about the view of the international community and OHCHR regarding the crimes committed by the Israeli occupation and the last decisions declared by USA. At the end of the meeting, Mr. James confirmed that the recommendations would be reported and passed to the high commissioner for human rights; and that they all would be considered to end the unjustified violations committed by the Israeli occupation. He mentioned that Israel, sometimes, did not commit to cooperate with the international community institutions. Thus, the only solution for such a problem was to end the conflict in Palestine. 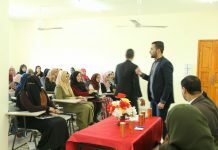 In the end, he thanked NSDL for holding this meeting and the guests for attending and participating in it, and he said that another meeting would be held later.